David is from Australia. 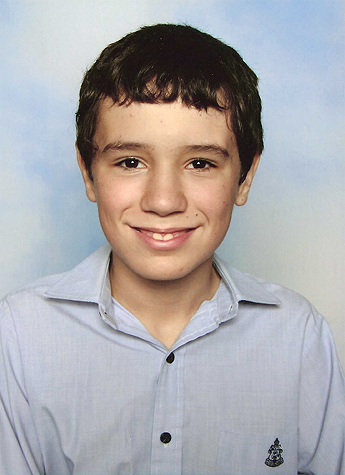 David entered our world in April 1998, at the John Hunter Hospital, Newcastle. His diagnostic process was lengthy during which BSLs were not maintained above 2.5 mmol/l (45 mg/dl). If BSL’s are maintained below 2.5 mmol/l(40 mg/dl) for more than four hours then organ damage can occur. Predicting neurological outcome at the best of times is difficult, so adding hypoglycemia into the equation makes it twice as difficult. David’s BSLs were controlled with diazoxide, but now he is maintained by feeding only. David was born by emergency C-section, and although surprised at how small he was, 2.75kg (5lbs 10 oz), I was amazed that he seemed so perfect. The midwife, when she handed him to me after he was delivered and had been weighed and measured, said “He is one ounce over the minimum mandatory testing weight for blood sugar levels.” At the time I thought “Why tell me if it is of no consequence?” Boy did that thought come back to bite! He displayed jitteriness at birth, but as no one paid attention to it, I assumed that it was normal. Immediately after he was born he breastfed very well. Later on the nurses came in and woke him up to get him to feed but he had feeding difficulties for the next 10 hours. The Night shift nurse coming on at 23:00 tested his BSL. She returned a few minutes later without him and calmly informed me that “his BSL was “a wee bit low, so I have taken him to Intensive Care”. There began the journey of finding out what was wrong with your baby and the length of time before HI rears its head. During this time his BSL’s were maintained in accordance with the hospital protocols, which were unfortunately set at below 2.5 mmol/l (40 mg/dl). Confirmation of hyperinsulinism was delayed until the lab tests could provide the information on the levels of insulin in his blood. He was finally discharged from NICU 4 weeks after he was born, just 24 hours before my husband Michael left to go overseas, so we were all able to travel together. I was concerned about what level of medical support would be available, but when we arrived in the USA, the Australian pediatric endocrinologist had made contact with a pediatric endocrinologist at UAB Children’s hospital. We saw her within a couple of days, and she was treating other children with HI, so I knew that we had come to the right place. He was maintained on his 4 hourly feeding schedule for a very long time – over 7 months. David also wanted to sleep through the night from an early age, about 6 weeks; having to wake a sleeping baby to feed him went against every baby rearing principle I had decided on. However we struggled through and all of us survived. His BSL’s remained stable for the whole time. At his 6 months endocrinology check-up I remember leaving the office, and thinking that we had made it to 6 months, and none of the dire predictions about his BSL’s and HI had actually happened. Then at the 11 months check-up we were able to reduce his diazoxide by one third, by missing out the daytime dose. Throughout all this his HBA1c remained in the good range, and increased at some stages. His liver function returned to normal at 8 months, by which time his diazoxide was less than 3mg/kg/day. At 13 months, his HbA1c showed an increase, and the Endo advised that we could cease the diazoxide as it was no longer an effective dose. David’s BSL’s remained stable, and he continued to grow. David started to suffer from a few issues, such as his legs and his eyes. Again, no one listened until he failed a milestone, then the specialists started to take notice. Had his issues been investigated when they first arose, David’s outcome may have been different. David has required a load of therapy over the period of his life and it still continues. The therapy has changed, from speech and foot therapy to a load of exercises for his additional problems. Unfortunately for David as his life has progressed, so have the acronyms of conditions that he has been diagnosed with also increased. David now has HI, Cerebral Palsy, Cataracts, Fine and Gross Motor skill problems, left sided hemiplegia, Sensory Integration issues, Auditory and Central processing issues, Attention Deficit Disorder and most recently, Attention Deficit Hyperactivity Disorder. David has had only a few hospital admissions since discharge from NICU, once for rotavirus, where his BSL’s just crashed from vomiting, so he was admitted, and then the rotavirus presented. Then two weeks later he was admitted for appendicitis. He is put back on Diazoxide when he has a stomach bug which stops him from eating very much. We prefer to monitor him at home and keep him at home for as long as possible, rather than take him to hospital. However once he reaches the low levels, we don’t mess around, as he can crash quite quickly once he reaches the lower BSL’s. He will also appear to be functioning normally with a BSL of 1.9 mmol/l (34 mg/dl). David’s conditions over time created problems with schooling, so David now attends a private school, which has a full-time special Ed teacher and additional assistants, who help all children who need a little extra. Our local state school could provide no support at all.